Standard Book Bag with no gusset. 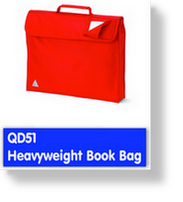 Do you want superior quality book bags at value for money prices? Well...you can with the book bags from Hand Print, printed with your own school emblem in either one colour or in full colour. Ideal as a homework file. 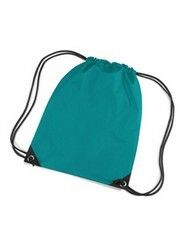 Great for carrying reading books and homework to and from school. Colours: RED, ROYAL BLUE, NAVY BLUE, BOTTLE GREEN, BURGUNDY, YELLOW, PURPLE & BLACK. 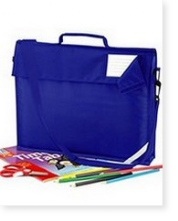 Made from heavy weight nylon materials you will be delighted that you bought these book bags. They are also available with shoulder staps if required. Colours: Black*, Bottle Green, Burgundy, Emerald Green*, Navy, Purple*, Red, Royal Blue, Yellow. Heavyweight School Book Bag with Detachable Shoulder Strap. 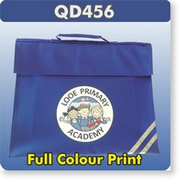 With 32 colours to choose from and prices that include a single colour print we have just the bag for you. Good quality bags at a great price. If you require something a little different from our standard book bags then we can offer you...heavy-weight book bags, book bags with shoulder straps, book bags with covered name tags and even fluorescent book bags. For prices please phone (01209) 842614 or email. All prices (except for Child sized clothing) are subject to VAT at current rate.